30 things about my invisible illness(es): Endometriosis and Adenomyosis. | The Endo The World? 30 things about my invisible illness(es): Endometriosis and Adenomyosis. Today marks the beginning of Invisible Illness Week. To help raise awareness of this excellent cause I have completed their #30things meme with reference to my endometriosis and adenomyosis. 1. The illnesses I live with are… endometriosis and adenomyosis. These illnesses can cause chronic pain and fatigue, as well as a wide range of other nasty symptoms such as gastrointestinal upsets, painful urination, headaches, and infertility. You can read more about my chronic illness journey on the Endometriosis UK website here. 2. I was diagnosed with these in… August 2014. 3. But I had symptoms since… I started my periods in 1998. That’s 14 years seeking a diagnosis. It was really difficult to cope, particularly in the five years leading up to my diagnosis as I started to feel ill on a daily basis. 4. The biggest adjustment I’ve had to make is… planning, planning and more planning before I do any social or work activity. I used to be able to ‘live in the moment’. Now each event or goal must be planned and executed with military precision to ensure that pain and fatigue don’t get in the way. 5. Most people assume… I’m in pain all the time. In reality, while pain is a big and unwelcome part of my life I find that my chronic fatigue, stomach upsets, and the anxiety/depression caused by my illnesses much more difficult to cope with and work around. Thanks to the oral contraceptive pill I currently have many pain free days each week. 6. The hardest part about mornings is… dragging myself of bed when I have awful, debilitating fatigue. It is really demoralising knowing that I have to face an entire day feeling unwell and exhausted. Most people don’t realise the bravery of this simple act of getting out of bed each morning when you have a chronic invisible illness. 7. My favourite medical TV show is… Scrubs (does that count?!). I love how effectively it captures how vulnerable patients feel, and the different ways they try to cope. I also think it’s a great reminder that doctors are only real people with hopes, dreams, fears, and flaws too. We can forget that sometimes. 8. A gadget I couldn’t live without is… my laptop computer. It has enabled me to blog about my invisible illness experiences which has been a lifesaver, and to connect with other chronically ill people- both in my community and on Twitter from all over the world. I don’t know how I would have managed without this. 9. The hardest part about nights is… trying to fall asleep. Painsomnia is a very real thing. I meet 3am way more often than I would like too. A lack of sleep also makes dealing with day to day life even more challenging. 10. Each day I take two pills and vitamins… my oral contraceptive pill and a vitamin D tablet. On a bad day this might rise to 10 pills if I need to take pain medication. 11. Regarding alternative treatments I… have tried acupuncture to help manage my pain, but I have really mixed feeling about it. However, I do strala yoga and circuit training which I love. It helps to clear my mind and strengthen my body. I believe that a strong body is better able to cope with pain and illness. 12. If I had to choose between an invisible illness or a visible one I would choose… an invisible one. As hard as it is to live with at least I can just pretend to be my old self sometimes. I can also reveal my illness to people at my own choosing and pace. 13. Regarding working and my career… it’s all gone a bit titanic. I work as an academic researcher and having severe fatigue, brain fog, chronic pain, and cognitive difficulties has been a huge problem. I am thinking of changing track in my career to better suit my new health priorities and physical capabilities, but I haven’t worked out what I’d like to do yet. 14. People would be surprised to know… I have cried about my illnesses every day since being diagnosed. They have broken my heart. At the moment I am seeing a therapist to try and help with this, but I know the sadness will never completely go away. 15. The hardest thing to accept about my new reality has been… the fact my my illnesses have no cure and are here to stay. I somehow have to find a way to live with these illnesses for the rest of my life and can never go back to my life the way it was before I got sick. Nobody trains or prepares you for this stuff. It’s a super scary minefield, but I am determined to rise to the challenge and live my life the best I can. 16. Something that I never thought I could do with my illness that I did was… put myself first by taking four months off work to have and recover from excision surgery. I knew I needed this operation for so long, but kept putting it off as I was worried about the impact this would have on my family and career. 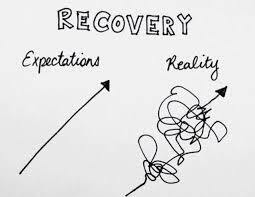 However, one month into my recovery I haven’t regretted the decision for a second and am doing as much as I can to ‘heal’ myself physically and mentally so that, hopefully someday soon, I can get my life back on track. 17. The commercials about my illness… are non-existent. I wish they weren’t as there is very low awareness among the general public about endometriosis and adenomyosis, despite up to 1 in 10 women being affected. 18. Something I really miss doing since being diagnosed is… going on epic adventures- climbing mountains, sky diving, traveling to remote places. I wouldn’t do such risky things now, knowing what I do about the state and unpredictability of my health. I can’t be too far from good healthcare, pain medicationss, and bathrooms at any given time. 19. It was really hard to have to give up… gluten, caffeine, alcohol, and red meat (for the anti inflammatory endo diet) so I stopped trying to. I figure I have enough to deal with without having to live a life of complete culinary deprivation. However, I have drastically reduced my consumption of these foods overall and am more mindful about what I am putting into my body. You can read about my endo-diet experiences here. 20. A new hobby I have taken up since my diagnosis is… blogging and tweeting. Give me a cheeky follow and say hello. I’d love to hear your invisible illness story too. 21. If I could have one day of feeling normal again I would… bask in every glorious second, and laugh as much as I could while totally meaning it and not faking the smile. 22. My illness has taught me… that the old adage that ‘you are nothing without your health’ is totally true and tragically under appreciated. Health enables every aspect of your life- fun, friendships, family, work, etc. Unfortunately, health is had to truly appreciate until it is taken away from you. 24. But I love it when people… are interested enough to ask questions about my health difficulties and how they impact on my life. For me, this is the main way that people can show me that they care and want to help me (and our friendship) to move forward positively. 25. My favourite quote that gets me through tough times is… this picture (I know that isn’t a quote, but a picture paints a thousand words right?!). It helps to calm my panic and steady my focus when my hopes for ‘recovery’ (whatever that means with a chronic illness) go slightly off plan. 26. 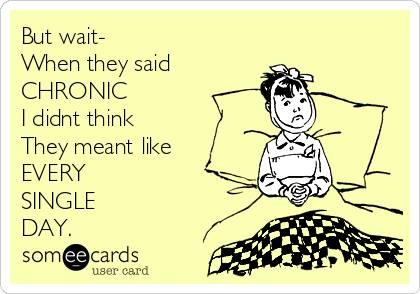 When someone is diagnosed I’d like to tell them… to reach out to other people with chronic illnesses in their own community (and the ‘#spoonies’ online). Tough times lie ahead so having some support from people who really understand will make a huge difference to your happiness and ability to cope. Also, people further down their chronic illness journey are an invaluable source of information and advice to help ensure you get the best care possible from your healthcare providers. 29. I’m involved in Invisible Illness Week because… this cause has been overlooked for too long. Any little thing I can do to raise awareness through sharing my experiences I try to do. 30. The fact that you read this just makes me feel…a little bit better understood 🙂 Thanks for reading. I’d love to hear your thoughts on living with an invisible illness. I’m particularly interested to know what’s the biggest life lesson you have learned since becoming ill. Bloggers, why don’t you complete this quiz too to help raise awareness of your condition. Take care of yourselves! ← Recovering from a laparoscopy for endometriosis. Very interesting reading as part of invisible illness week; I am a little under a year diagnosed and am still getting used to it all. I didn’t realise pain could become an almost daily occurrence. I’ve kept pretty quiet about my illness with colleagues, friends etc, in fact I’ve only mentioned the E-word to a few and even then I’ve spared the details. I am considering writing a small blog about this on my personal art blog. We’ll see. Thanks for reading and for your comment. I too have found the first year post-diagnosis very difficult, it’s a lot to come to terms with. I really recommend joining a local support group if there is one in your area! Sounds like you are taking it at your own pace though and doing what is right for you. I definitely think you should do the blog post- it might help. Let me know if you do, I’d love to read it. Take care and keep in touch. So glad I came across your blog. I am seeing my obgyn Jan 5th to discuss doing the laproscopy to finally diagnose endometriosis. I am grateful to be reading your blog posts, they are very informational and helpful. Thanks for the lovely comment, I am really glad you are finding my blog helpful. Good luck for your OBGYN appointment on the 5th, do keep me posted on how it is all going and let me know if you have any questions. Thank you so much, I will. Hello…I haven’t been diagnosed with adenomyosis, but it is a possibility. I’m scheduled to have a lap assisted tvh Jan. 30th. For the past few years, maybe 3-5 years, I’ve put things off. My GP just kept adding more antidepressants, which makes me feel even more crazy!!! So anyway the past I’ll say 4 yrs my period started becoming way more painful. It seemed every 3 to 4 months I would have a “Bad One.” Over the past year every period has become bad. The 28 day cycle has become whatever it wants! The pain is like having contractions or like I just had a DNC. I also refer to it as someone taking a dull knife and carving my uterus and cervix. I don’t have a lot of bleeding, but when I do its clots. Color ranges from grey, red, to brown. I’ve had multiple gyno issues since the age of 8. I’m excited about the surgery as I’m hoping that it helps me. For the past few months I’ve been really struggling with fatigue…I don’t mean just tired either. I mean I sleep all the time. My moods go from mad to sad almost at the same time. I feel like a failure as I can’t even keep up with housework. Will I truly feel better? Will I be more alive? Thanks. I really hope your surgery brings you relief. Maybe focus on having it and recovering from it for now and try not to beat yourself up about things too much. Keep me posted on how it all goes, and keep looking after yourself. Thanks for getting in touch. So sorry to hear you can relate to my experiences. It’s really tough. Take care and look after yourself, and do keep in touch. Why don’t you get a hysterectomy? Thanks for getting in touch. Unfortunately I still want to have children so a hysterectomy isn’t an option for me right now. This I the first time I’ve commented on any site since I’ve been searching. I was diagnosed with adenomyosis last month and I’m 33, 2 kids, and getting g a hysterectomy on de 28th. The pain I e been in constantly for the past 3 years has been unbelievable. I’ve absolutely refused to tell anyone, I mean what good does that do,right ! Like you said it’s an invisible illness, and honestly no one who hasn’t suffered from it can begin to take you serious, I told my husband it’s so b hard to feel like I do and look whole. I feel like **** most days and although I’ve done a great job of hiding it, the irritation of my condition gets out more than I’d like, I’ve taken it out on my husband most of all, I know I’ve been hard to live with, I don’t like me some days lol, so here is too parting with my uterus, I’m still having feelings about that but relief is welcomed, thank you for stories! Thank you for getting in touch. Really sorry to hear what you’ve been going though. Adenomyosis really is awful and a pain to live with. Wishing you the best for your surgery and recovery. Keep me posted on how’re you’re doing- I’d be interested to know. Btw.. those typos up there in my comment are ridiculous, I apologize! ! Thank you so much for sharing your story. I am so sorry you have to go through this everyday. I have also been living with these symptoms for 28 years. It became really pronounced after I had my son. I was 22 and had to drag myself out of the bed every morning. The pain, the fatigue, the brain fog – all these debilitating conditions I have learned to live with successfully over these years and that too without any meds. The main reason was I never got diagnosed until recently and I was told it was all in my head. So I just thought I would live an organized life with good physical, mental and spiritual hygiene, taking it slow etc. Until last two months, bleeding has gotten out of hand and I had to see a doc and she finally diagnosed me. It is a huge relief to know what it is. But also sad. I wil continue my regimen and hope that things don’t deteriorate. It is nice to talk to someone who can understand. Finally I know why I can’t figure out if I have a fever or not based on how my body feels because it hurts all the time. Thank u once again to u n all those who are spreading awareness about this..